So, after 6+ years, we now have a pretty visual picture to represent the official EzineArticles newsletter. I’d call it an “ezine” but then it’d be the “EzineArticles Ezine” and that’s just a bit confusing even to this nerd. If you have an ezine or actual email newsletter and you don’t have an image that represents the packaging of your ezine; you may want to test this strategy. If it helps sell more confidence or shows you’ve got your act together, it can’t hurt. Test and find out. If you’re reading this and you’re not on the EzineArticles periodic/weekly newsletter, mostly I send tips, secrets and insider strategies or case-studies designed to further help you further your article writing and marketing results. Go here to subscribe. Looks great! How did you create it? Or, more specifically, can you recommend any good and/or free software to create covers? I’d like to know the answer to Edward Weiss’ question too. Your newsletter image is super. When sending newsletters, do images get blocked in some recipients’ email boxes? I have seen some software on an eBook Website which said it was free, although I did not know if I could trust the software or the source so I did not download it, but it looked legit. It sure would be nice if we allowed those authors with over 150 articles to post eBooks on a Sister Site of EzineArticles.com as a bonus. “Platinum Plus” or something. 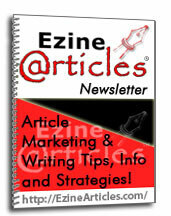 Then EzineArticles could take 45% and collect the money online and forward 55% to the author. Everyone could make money and if you had 150 articles you are obviously VERY SERIOUS about your writing? Thinking outloud, this is not a request, more like an idea. I received so many email questions about that post yesterday that I’m going to do a special issue that outlines how it was created along with alternative ways to create it yourself. Great idea, and the functionality was built into our database to allow that for more than a year now… Just need to make it happen.